The spinner dolphin (Stenella longirostris) is different from the bottlenose dolphin in size and in shape. It measures about 6.5 ft and weighs around 165 lbs making it the featherweight of the dolphin family. As its name suggests, it has a long and thin snout, colored gray on the top and white on the bottom. Hydrodynamic in shape, the snout allows for optimum water penetration. The Spinner can have from about 45 to 63 pairs of teeth. Its body coloring is a dark gray back, a white belly and a light gray band between the two. Another dark band connects its eye to the edge of its pectoral fins. It presents a large triangular shaped dorsal fin and pointed pectoral and caudal fins. 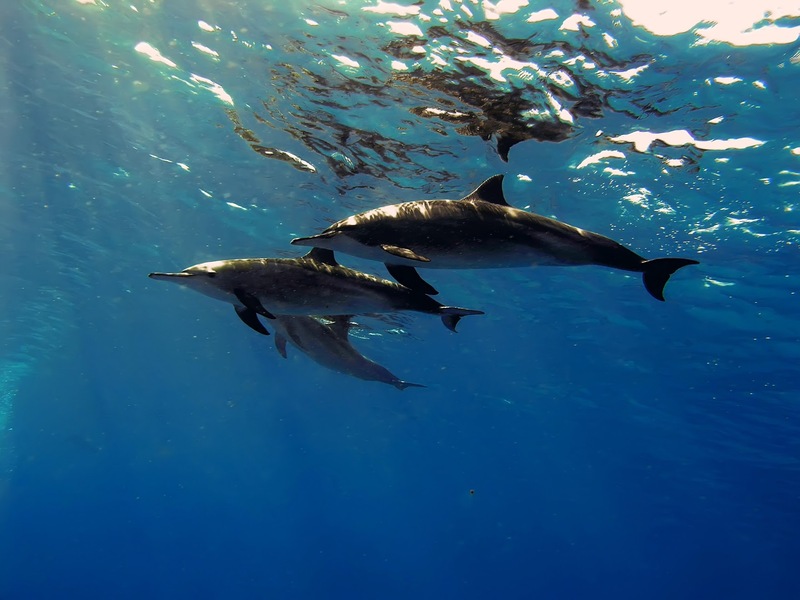 The spinner dolphin becomes sexually mature between 4 and 7 years old. The animals reproduce throughout the year without any real mating season. After 10 months of gestation, the female gives birth to a live baby dolphin of about 80cm. This small dolphin will be breastfed for 7 months and will remain close to its mother for 1-2 years. 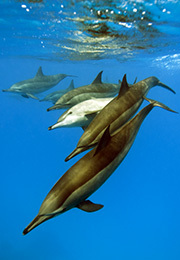 The spinner dolphin lives in large shoals of hundreds of individuals in the high sea. They feed on fish, shrimp and squid. 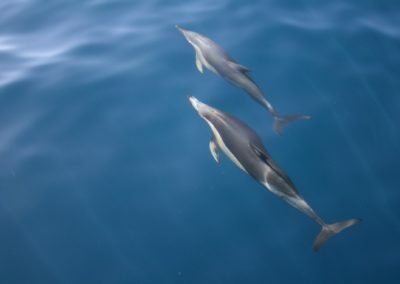 They chase during the night communicating with other group members with their inherent echolocation system (SONAR). They usually rest during the day; remaining inactive near the coasts and moving only to breathe. This agile long-snouted dolphin well-known for its playful demeanor demonstrated by the somersaults and acrobatics it does naturally. It has been seen to perform many jumps out of the water offering a wide variety of spins. Its specialty is the twisted jump which earned its name. These jumps are more frequent during the hunting periods or the dolphin’s waking up. Each jump has significance and contributes in the group’s cohesion. A spinner dolphin can jump up to 10 ft and also dive as deep as 985 ft depth. 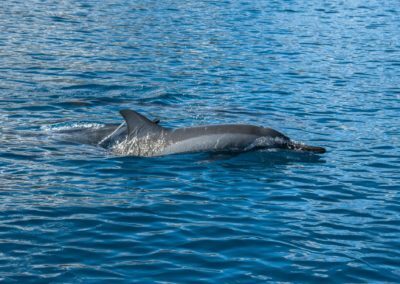 The spinner dolphin is a very “sociable” animal; we regularly meet shoals of spinner dolphins with other cetaceans such as humpback whales. It is also very playful and often swims at the bow of the boat. 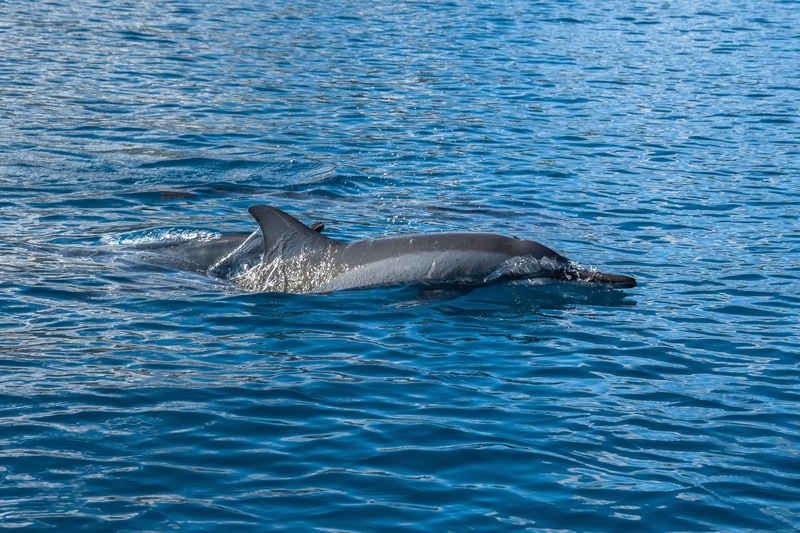 This behavior gives us great opportunities to observe the spinner dolphin in Polynesian waters.